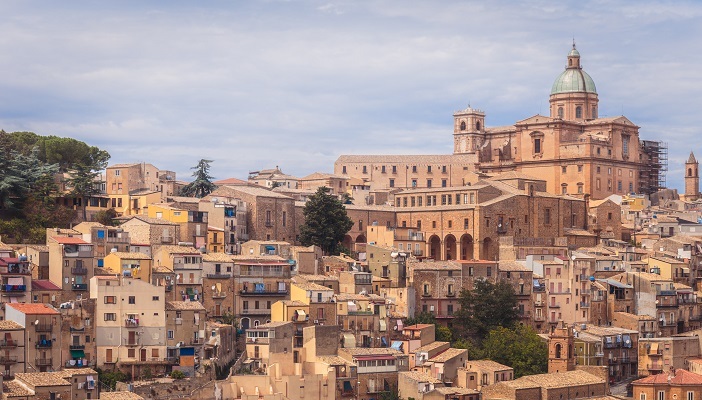 With its broad mix of invaders and fascinating history, it is not surprising that Sicily’s cultural calendar is peppered with colourful events and celebrations. From re-enactments of Norman conquests to the decoration of streets with floral carpets, the Mediterranean’s largest island provides its visitors with plenty of spectacular events throughout the year. The otherwise sleepy town of Piazza Armerina springs into action between 12-14 August (weather is usually good) each year with the medieval pageant of the Palio dei Normanni. Re-enacting the key historical moment of the conquest of Sicily in 1061 by Count Ruggero, the three days of celebrations kick off with a costumed parade and a blessing of the knights of the city’s four contrade. The Palio takes place on the final day, with the four contrade competing against each other in the Quintana jousting event, followed by a victory parade. Aside from the Palio, Piazza Armerina is best known for the extraordinary Roman mosaics at the nearby Villa Romana del Casale (opening hours Apr-Sep: 9am-6pm; rest of year: 9am-4pm). The Greek Theatre Festival in Syracuse (6 May-8 July – weather is usually good) is one of Italy’s top cultural events, bringing together a global audience attracted by the drama of the performance and the unforgettable atmosphere. Seating is on the white stone tiers of one of the largest amphitheatres ever built. 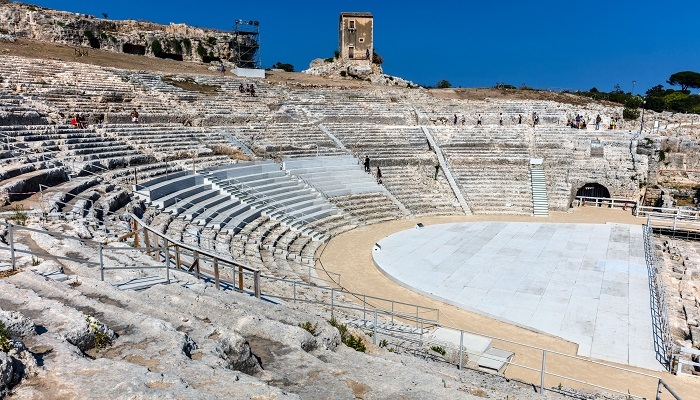 Performances are staged by the Fondazione Istituto Nazionale del Dramma Antico (INDA), with this year’s programme including productions of Seven Against Thebes by Aeschylus, Euripides’ Phoenician Women and The Frogs by Aristophanes. Ticket prices start at €50. 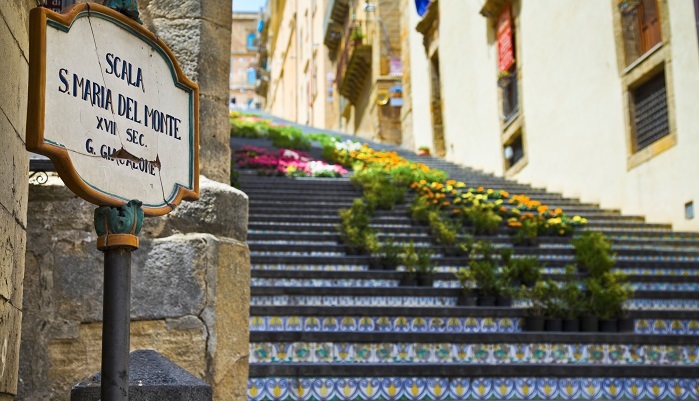 Best known for its ceramics and its impressive 142-step Scalinata di Santa Maria del Monte staircase, the hilltop town of Caltagirone (see the map) provides its visitors with two wonderful spectacles. Visit between around 12 May and 6 June for the Infiorata when the ceramic-inlaid stairs are carpeted in a floral display of thousands of plants and flowers composed into a picture. At the end of July (24/25) and again on the 14/15 August (weather is usually good), the stairs are lit up with numerous flickering candles during the Illuminata. 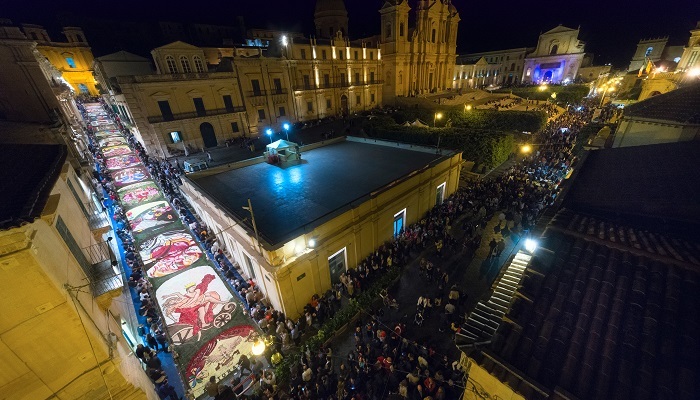 Noto’s flower festival, which takes place over the third weekend of May along the Via Nicolaci, is a wonderful tribute to Spring as well as an opportunity for local artists to display their creativity. The picturesque street, overlooked by elaborately carved stone balconies and Baroque palazzi, is transformed for 48 hours into a series of mosaic-style tableaux, created by floral petals. 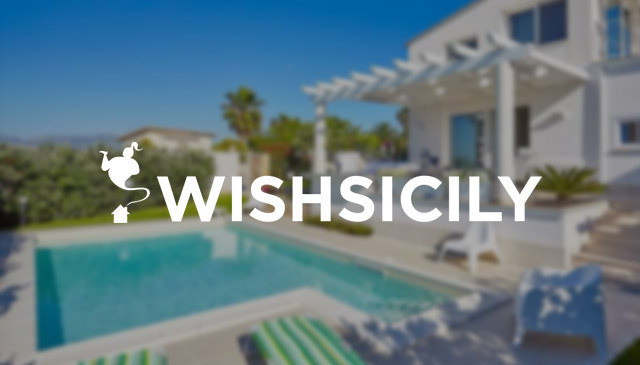 If you are interested in visiting any of these events during your holiday, choose from our large selection of villas and holiday homes in south east Sicily.